Size: 11.3"x 6.6"x 1.5", single cavity:9.3"x7.7"x1.6"
Package Contents: 2pcs animal cake decoration mold. 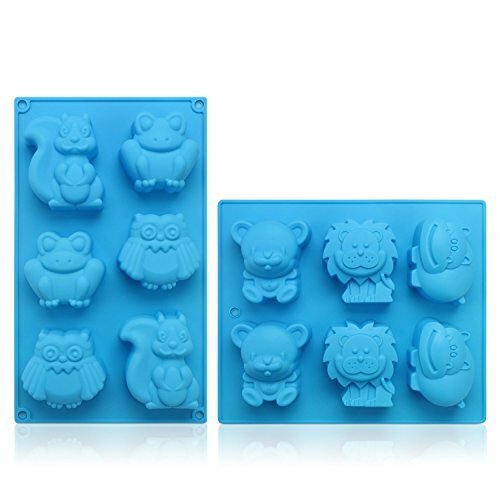 This soap mold is made of 100% food grade silicone mold, pass FDA/LFGB/SGS. Difficult to damage, cracking, durable, super-resistant to extreme temperatures, high temperature 230 degree, low temperature of minus 40 degree. Perfect for making soap, chocolates, hard candy, ice cubes with fruit juice, gummy paste, cake, cupcake, jelly, pudding decoration. Dimensions: approx. 11.3"x 6.6"x 1.5". Color will be sent randomly.